Officials said the building was unoccupied at the time of the fire and no injuries were sustained. The Bellevue mill is listed on the National Register of Historic Places and has been designated as a local historic landmark by the Hillsborough Board of Commissioners. Flynt Fabrics was the last occupant of the mill, which closed in September of 2000, according to a press release. Officials said the mill is slated to eventually become apartments. Firefighters worked quickly to contain the fire Friday afternoon at the 120,000 square foot building. Nearby business owners said they were immediately worried about the impact of the fire in the local community. “When we went out back I couldn’t believe the wind was blowing out of the southeast,” said Tommy Stann of Hillsborough BBQ. “It never blows in that direction. It kept everything away from us. The large plume of smoke billowing out of the structure was seen for more than five miles away. 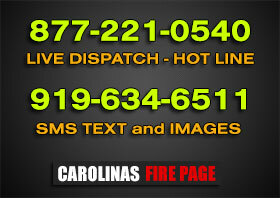 Fire investigators told WRAL News that the wet weather and quick thinking by neighbors helped contain the fire. “They had garden hoses out there and they were keeping the woods, separating the building and the mill houses soaked with water,” said Hillsborough Fire Marshall Jerry Wagner. Hillsborough Mayor Tom Stevens told WRAL News that the building has been unoccupied for more than a decade. Local restaurants opened their doors Friday night for the firefighters who battled the flames. “I’m thankful for them for saving our building and our streets, so this is a blessing,” Stann said. Officials said seven departments responded to the fire, which was contained by 7:20 p.m. Firefighters are continuing to work the fire that remains under the roof, which collapsed at 5:25 p.m., according to authorities. The State Bureau of Investigation, Hillsborough fire marshal and police detectives will investigate the cause of the fire with assistance from Orange Rural Fire Department and the Orange County Fire Marshal Division, according to a press release. The Cedar Grove, Chapel Hill, Efland, Eno, Mebane, New Hope and Orange Grove fire department all assisted in containing the fire. The Orange County Emergency Services and Orange Country Fire Marshal Division also assisted.